The Short Version: Travel by train into the heart of the unspoiled Connecticut River Valley on a unique two-and-a-half hour journey that begins at the historic 1892 Essex Station. Aboard the elegant Essex Clipper, you and your date will enjoy a four-course meal while gazing at soothing scenery and creating one-of-a-kind memories. 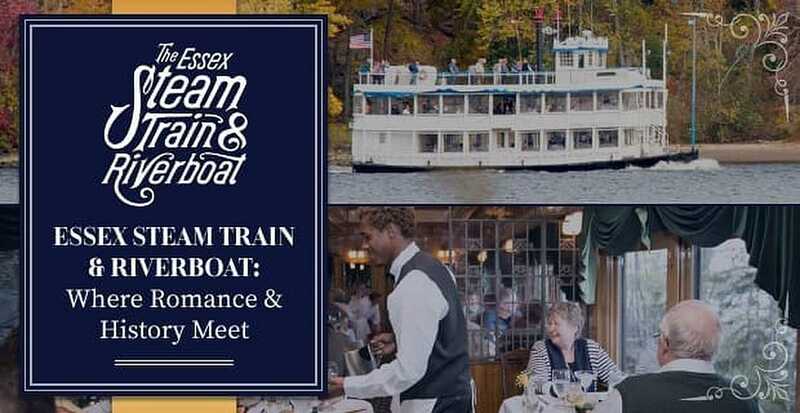 This is just one of the many extraordinary offerings of Essex Steam Train & Riverboat, established in 1971 and owned by the Valley Railroad Company in Essex, Connecticut. From vintage train rides to riverboat excursions and a collection of special event spaces, Essex Steam Train & Riverboat delivers personalized opportunities for the perfect first date, anniversary, or all-inclusive wedding celebration. Long before air travel and automobiles, trains were the predominant means of transportation in America. From double-stack cargo containers to opulent sleeper cars carrying the country’s richest families on the First Transcontinental Railroad, trains have a long and colorful history. For the folks at Essex Steam Train & Riverboat, the bygone days of rail travel make for a unique present-day excursion perfect for romantic dates and one-of-a-kind wedding celebrations. The Valley Railroad Company has been in existence in one form or another since 1868. Founded by James C. Walkeley, President of Charter Oak Life Insurance, the rail line was built through the beautiful Connecticut River Valley with its first ceremonial train run in July of 1871. Exactly a century later, the railway was granted service to Essex Steam Train & Riverboat and has been steaming ever since. Today, the company offers an eclectic array of exceptional experiences from its popular Swallow Sunset Cruises aboard the Becky Thatcher Riverboat to fall foliage expeditions along the countryside on vintage train coaches. A first date is nerve-racking. You’ve met a person you’re interested in getting to know better, found the perfect outfit, and gone over all the conversation topics that might make a good impression. Now it’s time to choose a location for your first encounter. Sure, an upscale steakhouse is nice. But it can be intimidating sitting across from someone you barely know. Why not suggest an experience that lends itself to making memories to last a lifetime? Check out the Gillette Castle Connection, a seasonal day-trip that takes you on a 30-minute train ride through the serene Connecticut River Valley to the Hadlyme Flagstop where you will detrain for a short walk to the Chester-Hadlyme Ferry. Once aboard, you’ll be transported to the base of Gillette Castle State Park for a unique hiking experience to Gillette Castle, home of the late William Gillette, famous for his stage portrayal of Sherlock Holmes. If you’re more of a low-key couple, there are also popular lunch excursions where you and a date will enjoy a three-course lunch aboard restored 1920’s Pullman dining cars as part of a nearly four-hour train ride and riverboat sightseeing trip that embarks at Deep River Landing. With each seasonal change, the team at Essex Steam Train & Riverboat puts their heads together to come up with new and exciting tours to keep couples coming back time and again. The popular Chocolate & Wine Cruise features a train ride from Essex Station to the Becky Thatcher Riverboat for a one-and-a-half-hour cruise where passengers will enjoy delectable chocolates and fine wine pairings. If fine cigars and brown spirits are more your thing, check out the Sunset, Cigars & Whiskey Cruise as premium whiskeys are paired with hand-rolled, Connecticut-wrapped cigars provided by Up in Smoke along with food provided throughout the evening, during a two-hour cruise on the Connecticut River. Other notable activities include Rhythm by the Rails, a live concert series throughout the summer on the lawn of Essex Station, as well as the Brats & Beer Cruise, joining grilled brats with an array of local brews, and East Haddam Concert Express for a trip to Eagle Landing State Park in Haddam, Connecticut, for an evening of live music. It’s no secret that Connecticut and other areas of New England bustle with tourists throughout different times of the year. Essex Steam Train & Riverboat adventures are a bit off the beaten path and make visiting the Connecticut River Valley a stress-free endeavor for you and your significant other. Headquartered in Essex, a small town in South Central Connecticut, the attraction is easy to get to via car or through the Old Saybrook Train Station, which is served by both Amtrak and Shoreline East railroads. There are plenty of places to stay, too. Check out the Griswold Inn, one of the oldest continuously operated inns in the country established in 1776 that combines historic accommodations with modern amenities. There’s also Copper Beech Inn, a renowned award-winning inn located along the Long Island Sound shoreline and close to charming shops and restaurants. After a full day of vintage train rides and peaceful riverboat rides, stop at a local watering hole for a bite to eat at one of the many eclectic eateries. The Blue Hound Cookery & Tap Room in Ivoryton, Connecticut, features coastal fare with a New Orleans flair. Penny Lane Pub in nearby Old Saybrook is a down-home gastropub with English-style bar fare and plenty of outdoor seating. From an outdoor ceremony on the lawn at Essex Station to cocktail hour aboard the Becky Thatcher Riverboat to a small-scale reception on a vintage train, there are endless opportunities to celebrate life’s special moments, including anniversaries, milestone birthdays and weddings. The site’s two indoor venue spaces include the Oliver Jensen Gallery, which is a smaller space, and River Valley Junction, which can fit up to 200 guests for a buffet dinner. Pam Amodio, Director of Sales and Special Events, Essex Steam Train & Lady Katharine Cruises, has 35 years’ experience and is the mastermind behind the company’s concierge-style event planning. With nearly 50 years’ in the train and riverboat business, Essex Steam Train & Riverboat looks toward a bright future creating one-of-a-kind memories for couples whether on their first date or setting a date for their nuptials. With the recent acquisition of Lady Katharine Riverboat, a luxury yacht experience out of Middletown, the team is always looking to add new events and excursions to their roster.